Gold Eagles and Gold Buffaloes are both U.S. Mint-issued. 3. What Are the Advantages of Buying Gold or Silver Bullion? 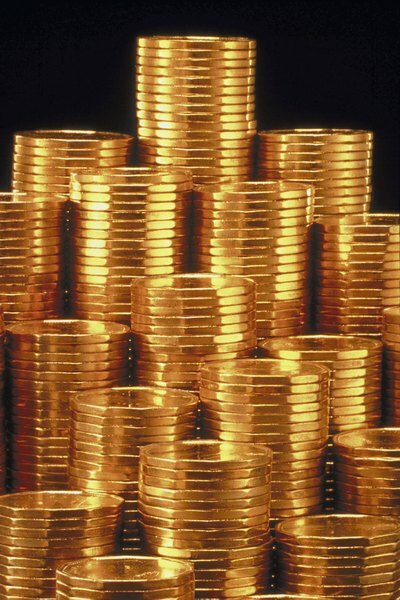 Gold bullion coins are one way to invest in physical gold. Coins minted by the U.S. Mint have the benefit of being backed by a government guarantee for their content and purity, making them a reliable store of value. The U.S. Mint issues two types of gold coins -- the American Gold Eagle and the American Gold Buffalo. The American Gold Eagle is an extremely popular choice among bullion collectors. It's been pressed since 1985 and available in sizes ranging from one-tenth of an ounce to a full ounce, and conforms to the 91.67 percent pure 22 karat standard that has been in existence for more than 350 years. Gold Buffaloes were first authorized at the end of 2005 and are made of 99.99 percent pure 24 karat gold. Both Eagles and Buffaloes are available as bullion and in collectible formats. The bullion coins are minted in bulk and are sold at a minimal markup relative to the value of the gold they contain. Collectible coins, such as uncirculated coins and proofs, are more expensive than bullion coins. When you buy a collectible coin, you're paying for its unique appearance or its purported rarity, but there's no guarantee that it ever will be worth more than the regular bullion coin. While you can buy collectible coins directly from the Mint, bullion versions of the Gold Eagle and Gold Buffalo can only be bought from a dealer. The U.S. Mint's list of dealers is a good place to start looking for a reputable one. When choosing a dealer, look at what each charges for the coin. Gold bullion coins are usually priced at a certain percentage above the price at which gold trades on the world's financial markets -- called its spot price. You can find dealers who will sell you coins for a 5 percent markup. At the same time, pay attention to shipping costs and to any credit card or transaction fees, which are common. All of those can increase your overall cost per coin. Once you start investing in physical gold, you'll need to figure out where to keep it. While gold coins aren't particularly large, they are valuable, and you could lose thousands of dollars if you misplace them or if they're stolen. If you choose to keep them at home, you'll need a safe storage site, such as a safe, and you may also need to have your homeowners insurance adjusted to cover the coins. Another alternative is off-site storage in an insured and bonded precious-metals depository. 321gold: Where Am I Supposed to Store All This Gold and Silver?